Sandpiper Beachfront Apartments are located at Broadbeach on the Gold Coast, just ten minutes away from Surfers Paradise. The beach is just across Old Burleigh Road and all apartments are facing the beach. This is accommodation that overlooks the sweeping Broadbeach parklands, with views of the ocean beyond that. Here you will find parklands with children’s playground, bicycle and walking tracks and public B.B.Q. area. Also within walking distance are over a hundred eateries, with choices ranging from cafes, brasseries, or a la carte restaurants of all different persuasions. Broadbeach is just the place for a relaxing break with the family, or a romantic weekend getaway on the Gold Coast. It is within walking distance to two areas of fully patrolled beach, perfect for the family to swim in confidence. Close by you will find a great range of shopping, cafes, restaurants and entertainment options including Jupiters Casino. 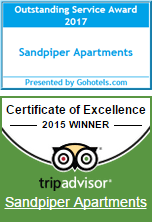 Sandpiper Beachfront Apartments offer one or two fully self-contained bedroom apartments that are all ocean facing, most with spectacular sea views looking out from private balconies. All apartments are equipped with kitchens and full laundry facilities, so longer stays are not an issue. We offer a fully self-contained accommodation experience in Broadbeach. The apartments have modern, vibrant and stylish interiors, with comfortable furnishings that are a pleasure to return to after a day out on the Gold Coast. The common areas below offer excellent recreational opportunities with an all-year-round heated pool, and accompanying spa and undercover BBQ and dining facilities too. On the forecourt, a tropically themed lawn sports a generous number of sun loungers, with a number of large sun umbrellas and tall palms providing shady respite for those who need it. Whether you are looking for a family getaway, a romantic aside, or a more adult adventure at Jupiters Casino, the Sandpiper Beachfront Apartments provides an excellent convenient location from which to explore the Gold Coast while enjoying ocean view accommodation at Broadbeach.